Progressive dies are used in higher-volume production and are designed to operate at high rates of speed. Stampo manufactures high-quality, reliable and cost-effective progressive dies for general appliances. We have the expertise and technology to design, test and manufacture progressive tools that meet a broad range of manufacturing challenges. Punching dies used for cutting blisters of all kind of packaging industry are high accuracy tooling with close tolerances and very long production rates. We are capable with our modern equipment and our knowledge to produce high-quality, reliable and cost-effective punching dies. Smart card industry is another field with such as demanding tooling that we can also support. 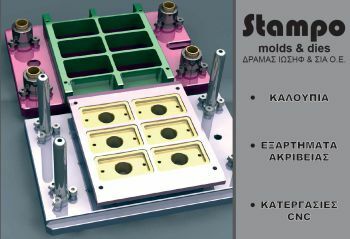 Stampo have over 35 years experience designing and manufacturing high precision multi-cavity plastic injection moulds. We utilise the most modern 3d CAD software available allowing us to simulate and debug a tool before ever getting to manufacturing. 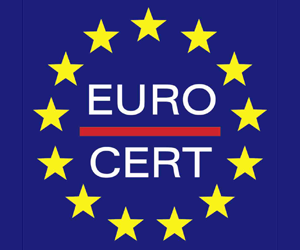 Our latest manufacturing equipment and quality control ensures building excellent tooling for general consumer products. We produce high precision components for demanding applications with our modern equipment. Close tolerances and quality control to each step give us the potential benefit to build difficult parts. One of our strong points is offering services regarding cuts in wire edm machine. Our experience is very big and as a mold manufacturers we understand all our customers needs because we speak the same language. Almost 30 years of producing in wire edm. Using wire edm for more than 25 years the drilling machine is mandatory. We can drill from 0.3mm to 3.0mm in diameter to parts up to of 200mm depth. One of our newest equipment is a laser machine with travels of 330x340x390 mm, precision of 0.02 mm and rotary table. It’s a 20W fiber laser with camera to center the parts and its capable to produce some colors in inox and steel. Our laser is a 3D true machine who can deep engrave. Small cavities, logos and very small details can be cut.